It is that time of the year again. As many of you already know I’m a big advocate of RRSP accounts and believe them to be the best wealth building vehicle available to salaried Canadians. However, the benefits of contributing, and the optimal amount of the contribution, vary greatly from person to person. Below I will try to help you make the optimal choice for your situation. How much you should optimally contribute depends mostly on your marginal tax bracket. The key observation to take away from the above chart is that marginal tax rates do not go up in an even step like pattern. They’re flat for the first 40K of your income, then jump very quickly from 42 to 46K (blue box above), go flat again from 46 to 74K, then again jump really quickly from 74 to 91K (red box) just to level out and go up very slowly afterwards. This approach gives you the best bang for your buck in terms of RRSP contributions because it ensures you max out your contribution room with the largest per-$ benefit in terms of a tax refund. You will still get a benefit if you choose to contribute more, but that benefit will get smaller very quickly on a per-$ contributed basis. 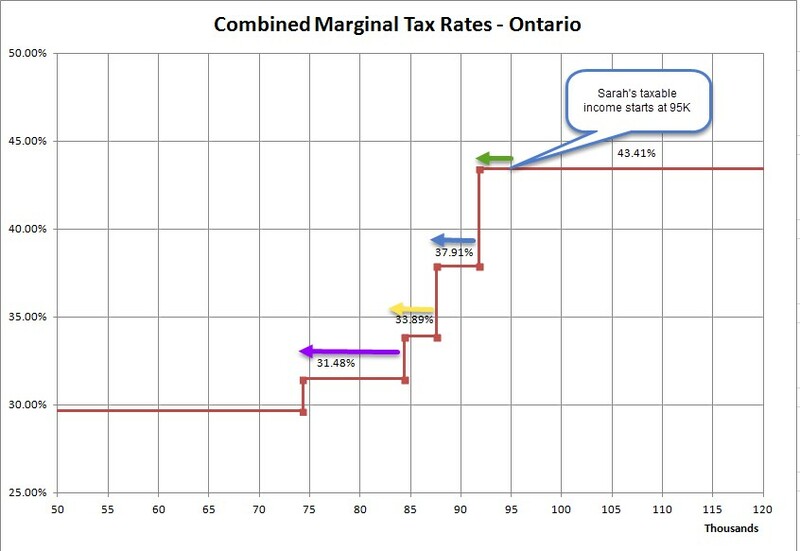 Each dollar Sarah contributes to her RRSP moves her taxable income down or left on our chart above. The per-$-benefit or value of this contribution is equal to the marginal tax rate she happens to be in. Since she starts on the 43.41% marginal tax rate line for every dollar she contributes she gets back 43 cents tax free but only for the first 4K contributed (green arrow above). This is because contributing 4K drops her taxable income down to 91K at which point any further contributions are at a lower marginal tax rate. I hope you can see how quickly the value of her contributions deteriorates after that initial 4K, which means Sarahs optimal contribution would be 4K and would net her approx. a $1,700 tax refund. Simple right? Well, ok, there is a bit more to it. If you truly want to maximize the benefit you get from your RRSP contributions, over your entire working career, you need to consider what stage of your career you’re at. In the Sarah example above we implicitly assume she is in the middle of her career and is likely to increase her salary at a slow and steady pace until she retires. John is in his 20’s and has an entry level job in his field paying him 55K, but is hopeful to progress quickly up the ladder. The average salary for an intermediate level employee in his field is 95K. 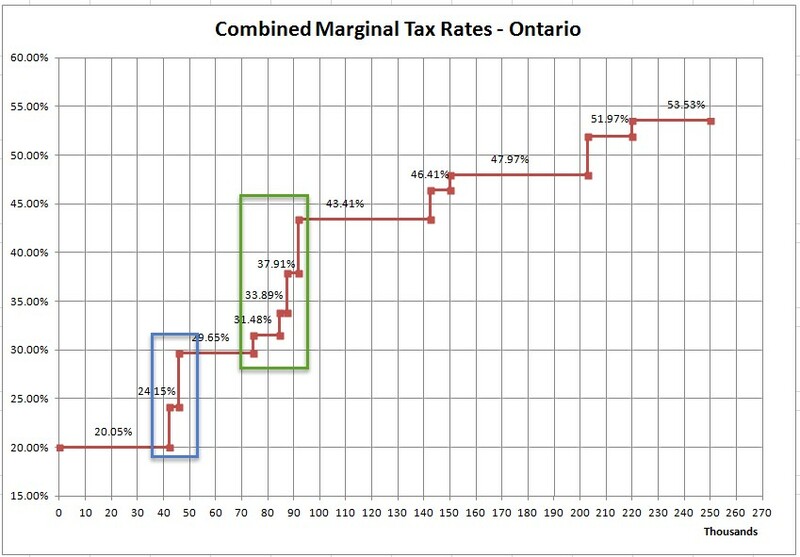 Since John is currently making 55K, based on the marginal tax analysis alone, it would seem he should contribute 9K to bring his taxable income down to 46K (green arrow). This would ensure he receives a tax refund of 30 cents per dollar contributed, or $2,700 for the entire 9K contribution. However, since John is in his 20’s, in an entry level job in a lucrative field, it may actually make sense for him to forego his contribution entirely this particular year. This is because RRSP contribution room is cumulative and rolls over to the next year if you don’t use it. Let’s say John salary goes up to 100K next year, his contribution maximum would be based on his previous tax assessment of 18% of 55K income, which would be around 9K. Therefore, if he contributed in the prior year, he could bring his taxable income down to 91K with this 9K contribution for a total refund of $3,900 (blue arrow). If John contributes in both years he will receive a total net tax refund of $2,700 (year one) + $3,700 (year two) = $6,400. However, if John foregoes his contribution in year 1, he would now have 18K worth of contribution room in year 2. 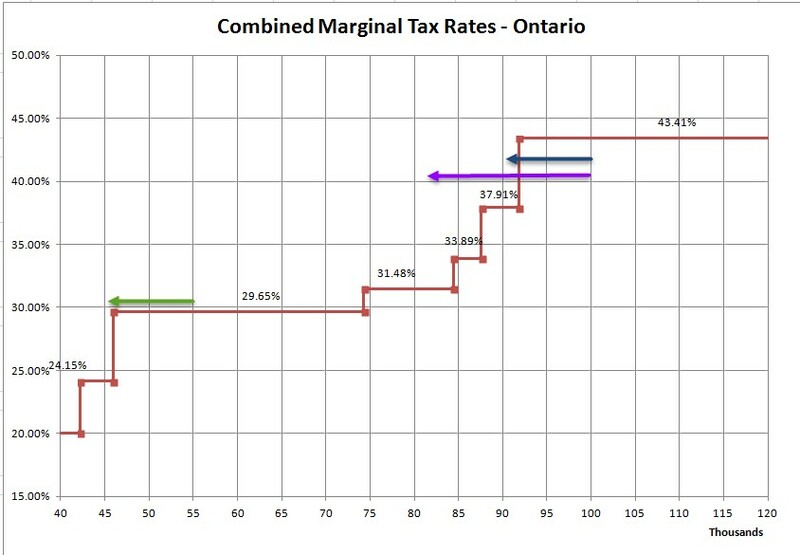 If he contributes the entire 18K in year 2 he would lower his taxable income to 82K (purple arrow). This would net him a total tax refund of 9K * 41.43% + 4K * 37.92% + 3K * 33.89K + 2K * 31.48% = $6,900, which is an extra $500 in his pocket. Brad is in his early 40’s and an experienced veteran in his field. The average salary for someone with his qualifications is 65K and he is making exactly this average. Since his salary did not change very much since last year his contribution limit is 12K. Since Brad does not expect to move into an appreciably higher tax bracket, he should probably try to max out his contribution every year. Even if Brad ends up getting a raise to 74K he would still be in the same tax bracket, so the extra contribution room would not help him next year any more than it does today. In fact he would have to get a raise in his salary above 85K before he would start to see any noticeable difference in his marginal tax rate (and his per-$ contribution value). 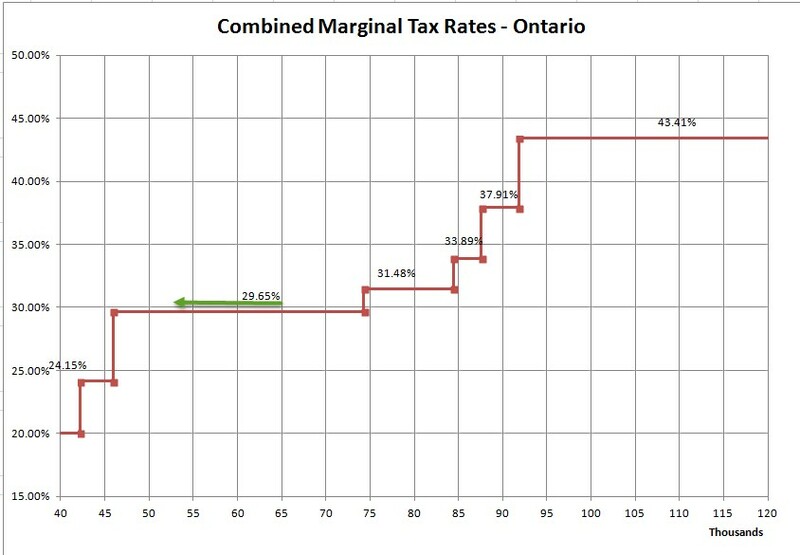 Most people follow an upside down U curve through their life when it comes to Marginal Tax Rates. They start out at a low marginal tax rate early in their careers, go up the curve to a maximum sometime before retiring, and then go back down to a low tax rate in their retirement. Understanding this is key to good RRSP contribution planning. The general rule is to contribute as much as possible during high earning years, and contribute less, nothing at all, or even withdraw during low earning years. This makes the RRSP an excellent rainy day fund in addition to being a great retirement vehicle. The times you are taxed the least on your withdrawals are also the times when you need money the most. It also makes it a pretty good vehicle for saving for an extended time away from work. This could be a maternity/paternity leave, change of careers, return to school or a round-the-world trip of a lifetime. The withdrawals in “lean” years will be taxed at far lower tax rates than the same amount of income would have been taxed at in the high earning years. I hope this helps you find an optimal contribution amount for your situation, and as always, I invite you to to subscribe to the blog by entering your email on the right side of the page, or use one of the buttons below to follow me on social media. Note: Do not confuse RRSP withdrawal ‘penalties’ with tax rates. The ‘penalty’ is only a temporary withholding tax, and in a low earning year, you will get most of that money back when you file your taxes. Note #2: An interesting observation is how slowly tax rates inch up for incomes over 91K. This basically ensures that contributing down to 91K or the maximum allowed (whichever is less) is the optimal strategy for any income over 91K. This entry was posted in Money on January 19, 2017 by Unassuming Banker.